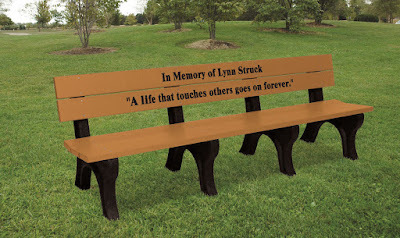 New Hope Women of Today: Help the New Hope Women of Today fund the Lynn Struck Memorial Bench. Help the New Hope Women of Today fund the Lynn Struck Memorial Bench. Lynn Struck passed away October 2014 surrounded by her loving family, after battling cancer for 3 years. In her 57 years she touched the hearts and minds of people too numerous to count. She was a loving wife, mother, grandmother and friend. Lynn was an active, contributing member of both civic and religious organizations including mission trips and religious education at the House of Hope. Lynn had the biggest heart and especially loved kids. She was a home child care provider for many years. She also volunteered her time to help at the Crisis Nursery, Ronald McDonald House, Red Cross Babysitting Clinic, local schools and more! New Hope Women of Today would like to honor Lynn for her many years of faithful service to the community with a bench placed in her honor at Northwood Park. The same park we hold our Ice Cream Socials, Park Play Dates, Duk Duk Daze, and a place where Lynn would push her grandchildren on the swings. As a 28 year member of the new Hope Women of Today Lynn was instrumental in recruiting new members and ensuring they felt welcome and needed. She opened up her house for many meetings and social events. Lynn initiated and chaired many projects to benefit our community and worthy causes, such as Duk Duk Daze, benefit dances and wreath sales that helped raise money for PRISM, Home Free, the March of Dimes, the Lupus Foundation, School District 281, and many other charities. Her giving nature kept her an active member to ensure that our chapter continues to flourish and remain an integral part of this community. Lynn truly left the world a better place! Please help us to fund the Lynn Struck Memorial bench to be placed in Northwood Park the summer of 2016. Personal contributions can be sent to Memorial Bench, c/o New Hope Women of Today, PO Box 41592, Plymouth, MN 55441. Checks should be made out to to NHWT, with “Memorial Bench” written in the memo line. Please contact Anna Nichols at Nichols.A@live.com with any questions.